Stir the tomatoes and sauce in a 6-quart slow cooker. Thoroughly mix the sausage and bread crumbs in a large bowl. Shape the sausage mixture into 24 (1 1/2-inch) meatballs. Add the meatballs to the cooker and stir to coat. Cover and cook on HIGH for 3 to 4 hours or until the meatballs are cooked through. Turn off the cooker and let stand for 10 minutes or until the sauce is slightly thickened. Layer each bun with about 1 ½ tablespoons cheese, 1 meatball and about 1 tablespoon sauce mixture. Top with the basil. 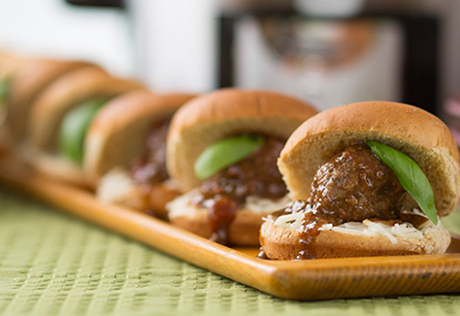 For Meatball Heroes, divide the cheese, meatballs, sauce and basil among 8 Pepperidge Farm® Soft White Hoagie Rolls with Sesame Seeds. For deeper flavor, brown the meatballs before slow cooking. Heat a 12-inch nonstick skillet over medium heat. Cook the meatballs until browned on all sides. Remove the meatballs from the skillet and drain on paper towels. Add to the cooker as directed above.